Concerns over incitement, Temple Mount prompt police to be on high alert ahead of and during the holiday. 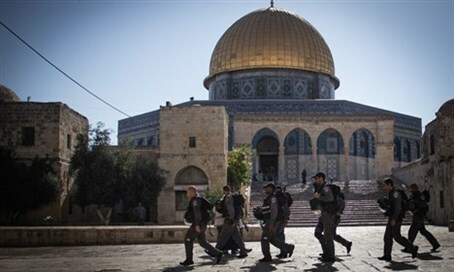 Police forces have flooded the streets of Jerusalem Friday, amid expectations from the security establishment that Palestinian Arabs will be breaking the quiet of the Temple Mount, and perpetuate terror attacks during the Passover holiday. The reinforcements will remain throughout the Chol HaMoed (Intermediate Days) period, Channel 10 reports. The Police are on the highest alert in months, it said, due to the usual wave of tourism to the capital during the holiday. While officials have promised not to stop Jewish visitors to the Mount over Passover, security officials are reportedly as concerned over those visitors "raising tensions" as they are about the Palestinian Arab population inciting terror during the week, the news agency reports. In light of this, Palestinian Arabs from Gaza and the Palestinian Authority (PA) controlled areas of Judea and Samaria will not be permitted to visit the rest of Israel during the holiday, as is usual procedure during major Jewish holy days.